Benny Morris is Israel's best-known revisionist historian. His history of the Palestinian refugee problem, first published in the late 1980s, became widely accepted as the definitive account of the Palestinian refugee tragedy. He demolished both the traditional Israeli and Palestinian versions of the exodus; the former suggesting that the Palestinians left voluntarily at the behest of their leaders, and the latter that the Palestinians were forcibly driven from their homes by organised and premeditated Israeli violence. Instead, Morris substituted a middle-ground explanation which defined the Palestinian refugee exodus as a by-product of war, rather than of 'design, Jewish or Arab'. His findings significantly influenced both Israeli historiography and education, and public attitudes to Palestinian national claims. As a result, more and more Israelis and Diaspora Jews began to accept the legitimacy of an independent Palestinian state in the West Bank and Gaza Strip. However, more recently, Morris has changed his spots. The failure of the Camp David negotiations in July 2000, Palestinian demands for a right of return to Green Line Israel, and the violence of the second Palestinian intifada have convinced him that the Palestinians have returned to what he considers the impractical extremism and rejectionism of the 1947/48 period. Morris now believes it is unlikely that the Palestinians will ever accept a two-state compromise with Israel. Morris's new book returns us to the foundational war of the Israeli-Arab conflict. He divides his narrative into five discrete chronological periods: the historical background from the 1880s to the 1940s, the United Nations debate and vote for partition in 1947, the civil war between the Jews and Arabs inside Palestine from November 1947 to May 1948, the conventional war between the Jews and the invading Arab states from May 1948 to January 1949, and the armistice agreements negotiated from January to July 1949. 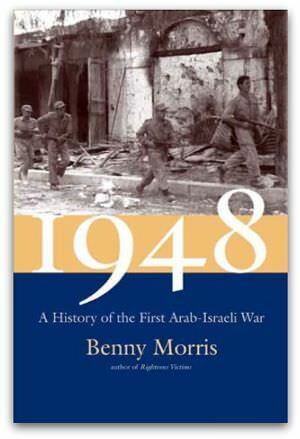 Morris argues from the beginning that the 1948 war was the inevitable outcome of the long-term Jewish-Arab conflict. He discusses the early Zionist settlers of the 1880s and their belief in the legitimacy and morality of a Jewish return to the ancient land. He cites their negative attitudes to the native Arabs, and their determination to take control of the country. In response, he notes the quick emergence of Arab hostility including recurring outbreaks of violence which would eventually culminate in the full-scale uprising of 1936. He argues that much of this violence was driven by religious symbols and rhetoric as well as by modern nationalist agendas, and that this jihad or holy war component contributed then and now to the intractability of the conflict. Morris covers the detail of the key historical events: the unsuccessful 1937 Peel partition plan, the 1939 British White Paper which severely restricted Jewish immigration on the eve of the Holocaust, the emerging pro-Zionist attitudes within the wartime US Government, the post-war Zionist revolt against British rule including the various acts of terrorism by the Irgun and the Stern Gang, and the famous Exodus Affair. He discusses in great detail the UN deliberations including the pressure and outright bribery applied to some member countries. But he argues that the key deciding factor was the strength of the humanitarian argument advanced by the Zionists in favour of a Jewish state as a fair response to centuries of Jewish suffering culminating in the Holocaust. The Zionists also displayed flexibility in accepting the compromise partition proposal. In contrast, the Arab delegates adopted an extremist approach. They refused to consider any solutions which recognised Jewish national rights in Palestine, and regularly threatened war as a response to partition. There were associated anti-Jewish riots throughout the Arab world. The civil war began on 30 November 1947, and consisted of two stages. The first stage which lasted till the end of March 1948 involved mostly local small-scale battles during which the Palestinians largely held the initiative, and the Jews were struggling to hold onto the territory allocated to their state. In the second stage from early April, the Jews went onto the military offensive, and crushed the Palestinians. This offensive was based on the famous Plan Dalet which emphasised securing the borders of the Jewish state, and protecting them against a potential external invasion. By mid-May 1948, the Palestinians had largely been marginalised not only as a military, but also as a political factor. Many had fled or been driven out of the country. According to Morris, the Palestinians enjoyed some numerical and geographical advantage, but the eventual Jewish victory was not surprising given their better preparation for war, more advanced training, more organised central command and control, and higher proportion of army-age males. Most of the young Palestinian men living outside the immediate war zone simply failed to participate in the war. Five Arab states invaded Israel in May 1948. But this was an invasion driven mainly by the pressure of public opinion, and lacking in serious preparation, strategic coordination or a unified command structure. To be sure, the Arabs enjoyed significant initial advantages in manpower and weaponry. But the Jews had superior training and command structures, and enormous motivation to protect their homes and lives. Moreover they were able during the course of the war to significantly increase both their manpower. They also increased their weaponry via exports from Soviet-controlled Czechoslovakia. Morris devotes discrete space to each invading army: firstly the British-trained Jordanian Arab Legion who posed the most serious military threat, then the Egyptians, the Iraqis, the Syrians, and the Lebanese. He also discusses the specific air and naval wars. He argues that by the time of the first truce, which was to last from 11 June until 8 July, it was evident that the Israelis had won, given that the invaders had failed to conquer any significant territory. Later the Israelis went on the offensive, and managed to seize control of the Galilee and the Negev. The eventual armistice talks would conclude with recognition of Israel's control of significant territory beyond the borders of the original UN partition plan. But the Arabs refused to negotiate peace treaties. Morris reiterates his earlier explanation of the Palestinian refugee tragedy as multi-layered, complex and closely linked to the particular stages of the war. During the first stage of the civil war, about 100,000 Palestinians fled or were displaced. Many were wealthy and middle-class families from mixed cities who left to avoid conflict and violence. Others were women and children who were evacuated at the suggestion of local and regional leaders. There were virtually no direct Jewish expulsions at this time. In contrast, the implementation of Plan Dalet in April 1948 saw the expulsion of Palestinians from hostile villages that came under Israeli control. However, Morris rejects charges by some pro-Palestinian historians that Plan Dalet was a blueprint for the expulsion of the Arab population. During the conventional war, the Israelis systematically expelled Arabs from conquered territories. Others simply fled as the invading Arab armies retreated. Most probably hoped to return within a short time either via military or political intervention. The Israelis later made a firm political decision to prevent the refugees returning on the grounds that they would potentially constitute a fifth column, and would also be a demographic and political threat to the stability of the new state. The Arab states refused to absorb or permanently resettle the refugees partly for propaganda purposes, but also because the refugees themselves argued that they had a right to return to their former homes. Morris argues somewhat contentiously that the expulsion of the Palestinians was justified because the Arabs may have planned to do far worse to the Jews if they had won the war. He cites numerous statements by Palestinian and Arab leaders calling for the expulsion of most of the Jewish population prior to the war, and also refers to the complete expulsion of Jews from the small number of settlements or neighborhoods conquered during the war. But this conclusion seems in the absence of any firm evidence on Arab plans to erroneously equate political rhetoric with firm military intentions. Morris is on firmer ground in noting that the war also indirectly created a second major refugee problem with over 500,000 to 600,000 Arab Jews fleeing or being expelled from their homes. Most migrated to Israel, but others resettled in western countries. Many later experienced discrimination from the largely European-dominated Israeli leadership, but ironically became fervent right-wing voters and opponents of compromise with the Palestinians due to their experiences of persecution in the Arab world. The key message from Morris's book is the continuing and passionate divide between the conflicting Israeli and Palestinian narratives over responsibility for the 1948 war. For the Israelis, the key contemporary factor was the still-recent Holocaust and the realistic fear that the Palestinians and/or the Arab States could perpetrate a similar massacre in the Middle East. Although they were successful in the war, they suffered 5700 dead (constituting one per cent of the Jewish population) and over 12,000 seriously wounded. The Israeli consensus was that the Palestinians became refugees only because of the war they and their Arab allies had initiated, and therefore the blame lay with those who had caused the conflict. For the Palestinians, the principal and understandable concern was that the creation of a Jewish State would lead to their dispossession and exile. They saw the war as an act of self-defence to protect their national inheritance. But the war resulted in the destruction of their society and the exile of much of their population. They continue to see the events of 1948 as an injustice that requires some form of reparation. Overall, this is a beautifully written and comprehensively researched book. There are a few minor omissions in the bibliography. For example, Morris does not directly respond to the contentious 'ethnic cleansing' thesis advanced by the anti-Zionist Israeli author Ilan Pappe in his two recent books. Nor does he cite the key works by Israeli historians Moshe Gat and Maurice Roumani on the respective Jewish exoduses from Iraq and Libya. And surprisingly he makes no reference to local author Chanan Reich's book Australia and Israel in discussing the Australian approach to the 1947 UN vote. But these caveats aside, this dispassionate and nuanced history is likely to be widely accepted as the definitive account of the 1948 war. Dr Philip Mendes is a Senior Lecturer in the Department of Social Work at Monash University, and the author or co-author of six books including Jews and Australian Politics. Dr. Mendes concludes his review with:"... this dispassionate and nuanced history is likely to be widely accepted as the definitive account of the 1948 war." Definitive ?? Wow! I would like to add a very few words in the here & now, January 2009 : OCCUPATION & DECADE AFTER DECADE AFTER DECADE AFTER DECADE .....and that is only since 1967. The conflict between the state of Israel and the Palestinian people is sometimes seen through a biblical prism as the return of the Jews to their Promised Land. But isn't it more realistically seen as another - perhaps the last - example of European colonisation and a settler society, where the indigenous people are seen as sub-human, where myths of racial superiority and 'manifest destiny' and fears of being overwhelmed by hoards of 'lesser breeds', blind the settlers to the reality of what they are doing and how they might reach a lasting reconciliation with those who have been dispossessed and displaced? The irony of the conflict between the state of Israel and the Palestinian people are that the ancestors of both shared that land at the time of Christ. Today’s Jewish people are the descendants of the Diaspora as at 1st century, plus those survivors (if any) of the Roman suppression of the Jewish Revolt. Now, the Jewish Revolters (Revolutionaries?) were people of the urban elite; priests, officials, wealthy business folk and so on. Among their ancestors were those who returned from the Babylonian Exile. Today’s Palestinians are descendants of 1st century Palestine’s peasantry. When Jerusalem was destroyed they became Jewish Christians (Jesus himself was of this class), later many adopted Muslim. Christianity and Islam both are at least partially derived from Judaism. I see points of comparison between the history of Israel and Palestine, and the Parable of the Prodigal Son. The major difference, however, is that post-Holocaust Zionists were not so much Prodigal returnees as brutalised, traumatised victims of post-traumatic stress disorder. The ‘Good Sons’, the Palestinians, are as described by Nick Cave in his song. That the Holy Land is still the scene of so much fratricidal bloodshed, must surely gladden Hitler’s ghost. Warwick, or another narrative is that most of the Israeli Jews arrived as refugees from the place of their birth. I assume you always vote for whatever party in your country favours kicking out immigrants - aka "colonialists". Care to point out an even remotely mainstream Israeli claiming some sort of racially superiority? I mean actually claiming that as opposed to something you can massage to mean that? Benny Morris has been an apologist fro colonisation for long and no wonder Mendes appreciates him. Plan Dalet had the unstated intention of expelling the Palestinins and Why should they accept partition ? The plan awarded the greater part of their country to the Zionists who owned less than 13 per cent of the land, often acquired through fraudelent documents created in Beirut and Paris and using racist polices of excluding Arabs from work? The Zionists had everything to gain by accepting the partition, a formal base to begin their work of creating an eretz Yisrael.